Sidewalks in Japan are ridiculous. They are everywhere, even along stretches of highway, and everyone cycles on them (even though technically you are supposed to cycle on the road I think) so that is good. They provide you with a nice refuge from busy traffic. Also good. But sometimes they also end abruptly, leaving you stranded on the wrong side of the road with no way to continue. Or they’re full of plants. Or they slowly become more narrow, trapping you and your panniers until you have to literally squeeze through. We have been playing a game of ‘Dodge the Highway’ for the past few days, playing in hard mode which includes sidewalks like the ones mentioned above. 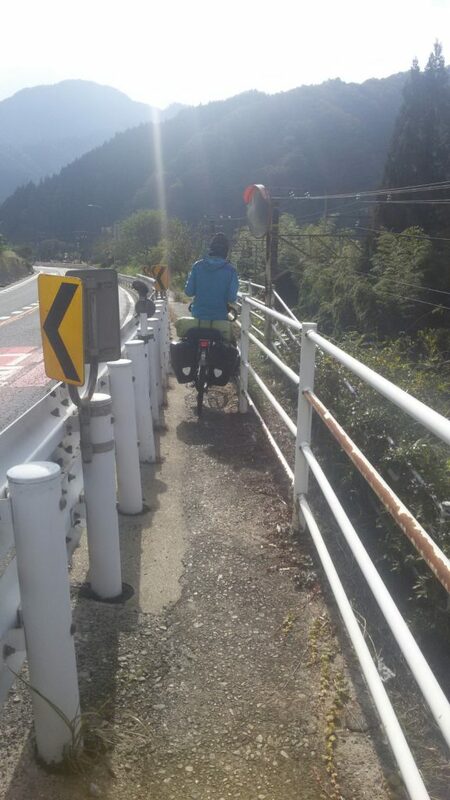 Since getting out of the Alps we have been roughly following the old Nakasendo road. The Nakasendo was one of the five imperial roads spreading out of Edo (Tokyo), this one connecting Edo to Kyoto straight through the mountains (unlike the Tokaido, which connects Tokyo and Kyoto along the coast). Most of it has been replaced by a modern highway, the dreaded road 19, but in some of the old towns are well preserved and it was those we were looking for, while at the same time trying to avoid road 19. Hopping from sidewalk to sidewalk, taking the narrow streets in the old towns and weaving back and forth over/under/along road 19. Sometimes our navigation would send us right along the actual old road. Back in the days they didn’t really bother with switchbacks so this involved some pushing of our bikes straight up the mountains, with inclines of 15% or more. But there were also beautiful temples, old houses, bamboo forests and castle ruins. The cherry on the cake was our (unofficial) campsite near an old teahouse on a hilltop that has been serving tea to travellers for centuries. For two days I’ve been feeling awful, waking up with a pounding headache every morning that only subsides by mid-afternoon. Overall a lethargic feeling too, no energy, even though I try to drink & eat enough. Not a good combo with having to push your bike up old cobblestone paths. Maybe I’m getting sick? We’re taking a lot of breaks and therefore only doing 40-50km a day. This by itself is not really a problem because we are still on our self imposed schedule, but it is frustrating to move so slowly. The scenery and weather are great, but can’t seem to break through the mind-foggy state I’m in. Everything is just passing by. I register and appreciate, but am not really impressed anymore. Am I bored? Maybe it’s time for a break? In the evening I feel like I should maybe cry except I can’t because I don’t really have a reason to. The next morning I stumble out of the tent towards the bathroom in the park we’re camping in and I discover I got my period. Well D’oh, that explains everything. The headache and brain fog are gone. We have been avoiding big cities so far, but it would be a shame to spend three months in Japan and not see Kyoto, so we follow (roughly) the Nakasendo to Lake Biwa and from there ride into Kyoto. It’s a nice city, easy to get around by bike/foot. After spending so many weeks in the mountains and small towns it is nice to be in a bigger city again, with all the luxuries associated with it: plenty of restaurants, bars, shops and cafés. We don’t really visit any of the sights one normally visits in Kyoto (temples, castles, gardens) but just walk and walk and spend a lot of time watching people. This includes groups of giggling girls dressed up in kimonos, which is apparently the the thing to do when visiting Kyoto. We’re staying here for two nights. Tomorrow we will take the shinkansen (bullet train) to Hiroshima. Stay tuned!